Believe it or not, a lot of entrepreneurs find it challenging to choose a brand for their business. It is difficult not because they can’t come up with new names but because whatever names they come up with, a quick trademark search more often than not reveals that a majority of them are already being used by someone or the other. And, even if it is not practically used, for some finding a .com domain becomes a challenge. Practically you can’t do much about the availability of a .com for that matter. However, what you can and need to do is to ensure that when you think of a trademark or brand name for your business, service or product; it is free of any trademark related issues. And the best way to do that is not to limit yourself to a quick trademark search but perform a thorough search for similar trademarks to ensure that your trademark doesn’t violate someone else’s trademark rights. The first step towards avoiding trademark conflicts is performing a full and thorough clearance search for trademarks (or brand names, trade names, company names, etc.) to ensure any related trademark issues can be eliminated to a greater extent. A trademark clearance search is ideally performed prior to the adoption of the trademark and investing in the brand, and involves the steps of reviewing all similar trademarks registered, under the process of registration, or in use. However, you can also do it at a later stage if you are not sure that the trademark you are using is clear of any conflicts. Ideally, such trademark searches or trademark registration searches should be done by trademark lawyers and / or agents, but I am going to provide you enough information on how to do it yourself before you decide to select your brand name (or file for trademark registration) and be emotionally attached with it forever. If you need professional help with search or filing and prosecution of the trademark, you should definitely consider seeking assistance from our curated list of professional premier trademark firms in India. Please provide free quotes from top trademark law firms. For your understanding, let’s go through the trademark search process with a hypothetical trademark ‘LOVEKART’ which we hypothetically wish to use for fashion and apparels. In this example, we will be limiting our search to the core class 25, which deals with clothing, footwear and headgear for illustration purposes. For the convenience of the public and users, the then Controller of Patents, Designs and Trademarks in a notification dated 13th January, 2011; made available free public trademark search on the IPO’s official website. Any trademark which has ever been filed with any of the five trademark registries in India is available during the public search of trademarks, whether registered or during the process of registration. To find similar trademarks, the most used search type used is that of wordmark. Start with – This option provides results which start with the keyword entered. It is a good idea to start with the full trademark as the results will be very relevant. If no similar results are found, then break the word and try again. E.g. ‘LOVEKART’ in class 25 (clothing) doesn’t provide any results, whereas ‘LOVE’ in class 25 gives more than 200 results. Contains – This option provides results which start, end or contain the keyword anywhere. It is a good idea to always do this search as it much more comprehensive than the ‘start with’ and ‘match with’ options but usually is the slowest amongst the three search types. Match With – This option provides results which are an exact match to the keyword entered. It is not very useful during trademark clearance searches. However, if you know the exact trademark and want to quickly find the relevant result fast, it serves the purpose. E.g. For ‘LOVEKART’ no results are found in class 25. And for ‘LOVE’ only 4 results were found. All results starting with the keyword will be shown. All results starting, ending or containing in the middle will be shown. Only exact match results will be shown. Although, the results are not perfect all the time but this search type is very useful if your trademark doesn’t pull out any relevant results during the wordmark search. It is highly recommended to also run the Phonetic search type in addition to the wordmark search type. e.g. a search for ‘LOVEKART’ in class 25 under phonetic search gives over 20 results with a few slightly similar marks like Lovecare. Many of the results are not that relevant but sometimes the phonetic search results in magically relevant results. So it is worth spending some extra few minutes to be sure. C. Vienna code search – Sometimes, a trademark application can also contain visual elements which may make it difficult to search for similar marks. India being a member of the Vienna convention, also follows the international classification of the figurative elements in a trademark. Vienna classification is only applicable to marks with visual elements such as logos. Whenever a trademark application containing a visual design is filed in India, it is sent for Vienna codification to make it easy for searching later. In order to perform a search for similar trademarks having visual elements, a search has to be performed by using the Vienna code (minimum six letters) along with the class. 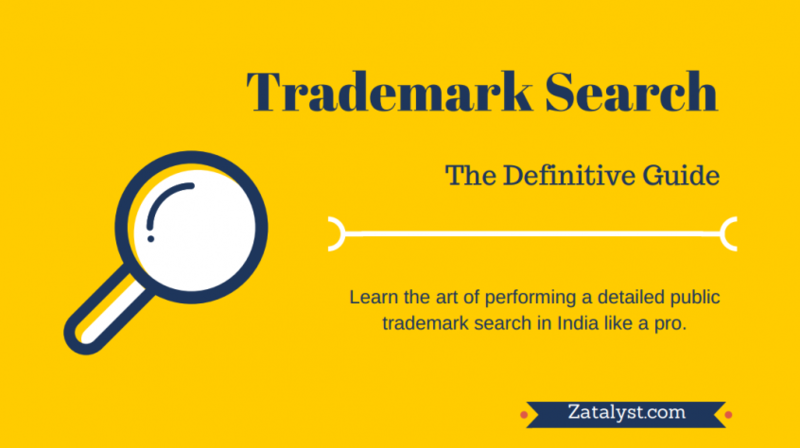 Prepare an exhaustive list of keywords similar to the trademark you wish to register. E.g. Lovekart, lovecart, luvkart, luvcart, love, etc. The Indian trademark system is divided into 45 classes. In many instances, your goods / services may fall under more than one class. In such a scenario, it is a good idea to protect your business in each of the relevant classes. However, if you are strapped for funds and looking to protect in the core class, it is still recommended to perform a search in all the classes to ensure that the chances of future conflict are minimized. e.g. clothing falls under class 25. However, other classes like class 24 for textiles, and class 35 for retailing services may also be relevant and you may want to cover those classes during the search. Repeat the above steps with the other keywords like lovecart, luvkart, love, etc. If there are other relevant classes, perform the same steps in other classes as well. View search results, detailed information and generate reports. Select ‘Contains’ option under wordmark and repeat earlier steps [Step 3.1. (1 to 4)] to view and generate report. Select ‘Phonetic’ under search type. Enter the keyword and class to run the search. The results are a mixed bag with a lot of useless results but sometimes the search pulls some really useful results. Select the relevant results to generate reports as mentioned in earlier steps [Step 3.1. (1 to 4)]. As a general rule, the higher the similarity value (e.g. 5,4) the higher the chances of getting a trademark registered; and the lower the similarity value (e.g. 1,2), the lower the chances of getting a trademark registered. In order to perform a through trademark clearance search, it is equally important to not only rely on the Trademark Registry’s database, as many of the trademarks in use may not have been filed for registration with the trademark office. Hence, for a through clearance search, it is recommended to perform a trademark search on other databases (like Madrid applications designating India, MCA company database, Common law databases) before making a final decision on selecting and protecting your trademark. India joined the Madrid protocol for the International Registration of marks on 8th July, 2013; thereby allowing foreign trademark owners to cost effectively and easily protect their trademark portfolios. Since, India can now be designated during international filings, it is important to ensure that a search for international trademark designating India is also performed during the trademark clearance search process to avoid any complications subsequently. The search can be performed on the Romarin database. There are three parameters which are important to be searched. Mark – Enter your keyword which you need to search. The database allows for the use of search operators like *. A search query like *keyword* will show results similar to the ‘contain’ search in India and is recommended. Nice classification – Since, India also follows the same classification system, just enter each of the classes you are interested in searching. The advantage of this database is that you can enter multiple classes separated by a comma. Designated Contracting Parties – Since, we are primarily interested in countries which may enter India, simply enter ‘IN’, which is the two letter Wipo country code for India. The Ministry of Corporate Affairs maintains a record of all incorporated organisations. If a trademark is selected which is similar to the name of an organization in India, the chances of conflict increases. Hence, performing a search on the MCA company name database is also recommended. The MCA search portal provides an easy search option for both Company and LLP. Multiple keywords can be inputted simultaneously to view the results in a single interface. Since, trademark law recognizes prior usage of a trademark even if not registered, hence, a search for similar marks not yet filed for registration is also advised. A common law search can be performed on business directories, yellow pages, search engines, etc. At least a search on search engines like Google is advised as such a search can cover a lot of common law databases. Once you have performed the search for each of the trademark names or brands and retrieved the results, the next step is to determine the chances of registration for each of the names you selected. I personally prefer to simply grade the results on a scale of 1 to 5, with 5 meaning the trademark I have has very high chances of registration as no similar trademark was found and 1 meaning that there was an exact match found in the database and the chances of registration are extremely slim. 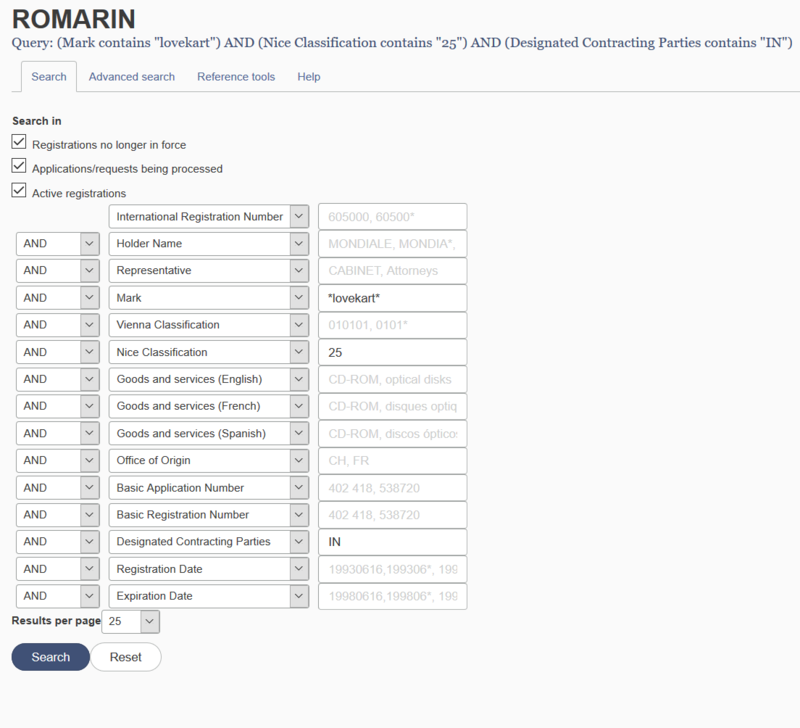 After entering all the trademark options, fill each column with the trademark similarity rating number. The trademark option with the highest total score will have the highest chances of registration. This approach though simple to execute is not a substitute for legal advice. It is highly recommended to approach a qualified and experienced trademark lawyer to eventually provide you a trademark search and clearance opinion. However, you can use this technique to shortlist and identify a handful of trademarks from your list before you approach professional help. In an ideal scenario, a search for related classes should also be performed. An online trademark search should always be performed on the official IPO’s website as the same database will be used by the trademark examiners during examination to decide the fate of the trademark application. Even if you use a third party search database, it is recommended to perform a concluding search on IPO’s official database to avoid any surprises later during the process of registration. Some really old trademark applications, which are not yet digitized may not be available.